Home / / Norman Bates is Coming For You!!! 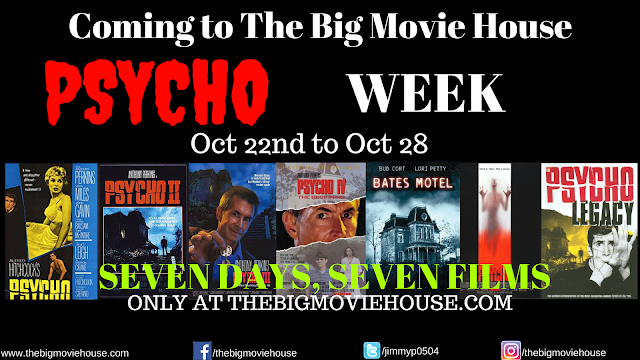 Are You Ready For PSYCHO WEEK?!! Norman Bates is Coming For You!!! Are You Ready For PSYCHO WEEK?!! Next week, we at The Big Movie House are going to be spending a week up at the Bates Motel and we hope that you will come along with us. The original Psycho is a huge film, not just in the horror community, but in the film community as a whole. It is considered the granddaddy of the Slasher film, and has been scaring the crap out of people almost 60 years. We have all seen the original, and if you haven't you NEED to. But how many out there have seen, or even heard, that there were three sequels, one of which had prequel elements to it, a failed TV pilot, and a documentary about the franchise as a whole? I know that some of you out there have, but not everyone. So come with us next week (October 22nd to the 28th) as we take a look at all of the films that make us one of the most beloved horror film franchises of all time.